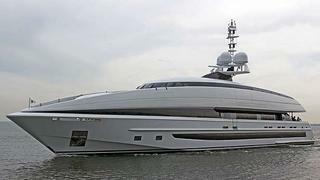 Crazy Me, the recently-launched 50m custom superyacht built by Heesen, has begun her sea-trials. Entirely built in aluminium, Crazy Me has an aggressive and unique profile in which you can immediately recognise the design of Gary Grant, who closely worked with the owner. The naval architecture is by Van Oossanen and the yard in-house team. The clean and contemporary interior, designed by Cristiano Gatto, accommodates 12 guests in six cabins: a master suite, a VIP and four double staterooms. Special features include an upper-deck glass-bottom swimming pool, through which light filters to the aft deck below. ABS-classed and MCA-compliant, this semi-displacemement superyacht is powered by twin MTU 16V 4000 M93L engines giving a top speed of 21 knots and a cruising speed of 18 knots. Crazy Me is scheduled for delivery later this summer.